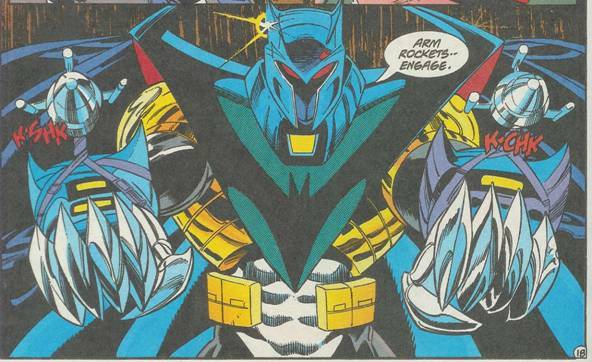 DC comics during the early 1990s was a paragon of turmoil. Hot on the heels of Robin meeting a bloody end in 1988, something which caused a media sensation, someone brilliantly suggested they kill off Superman. And they did, and there was an even bigger media sensation. What’s the old saying? There’s no such thing as bad publicity? I remember guys buying stacks of the coveted death issue, hoping to pay off loans, buy new homes or what have you in the near future. Of course, hindsight is 20/20, and a lot of these folks are lucky to get $15 for their copy. Well, where do you go next? Kill Batman? You could, but how do you explain his return? Superman is grounded in science fiction, so resurrection is plausible. With Batman, the gritty, realistic urban crime scenery doesn’t seem to suggest mytical or super scientific renewal. Besides, they just killed Superman and Robin, you don’t want to get too predictable here. So they break his back instead. And there’s another media sensation (sort of). Yes, he does come back eventually, thanks to a super-powered healer girlfriend Bruce Wayne picks up and… huh, what was I saying earlier about keeping things real in Batman? Nevermind. Arm rockets? Finger knives? Could you picture AzBats (Azrael and Batman combined – thank you world wide web) rescuing someone who fell out of a window with his finger knives? 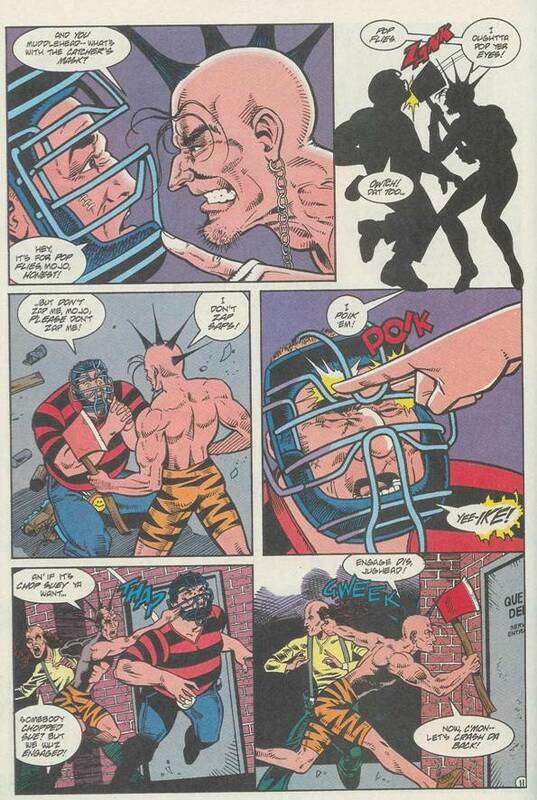 Hairy, Surly-Schmoe and Mojo = Larry, Curly-Joe and Moe, the Three Stooges with a decidedly modern twist appeared in issues #506 and #507 of Batman. Now Batman is no stranger to comedy. His arch-nemesis is a clown, and he’s met up with Jerry Lewis (Jerry Lewis #97), and had a less than tense television stint in the 1960s. And, of course, there were Robin’s horrible puns that prompted many people to vote for his demise in 1988. Still, what was the writer thinking when he brought the Stooges in? And with Curly-Joe? Curly-Joe? If you’re copying the Stooges, why not just use Curly, or would that be too obvious? 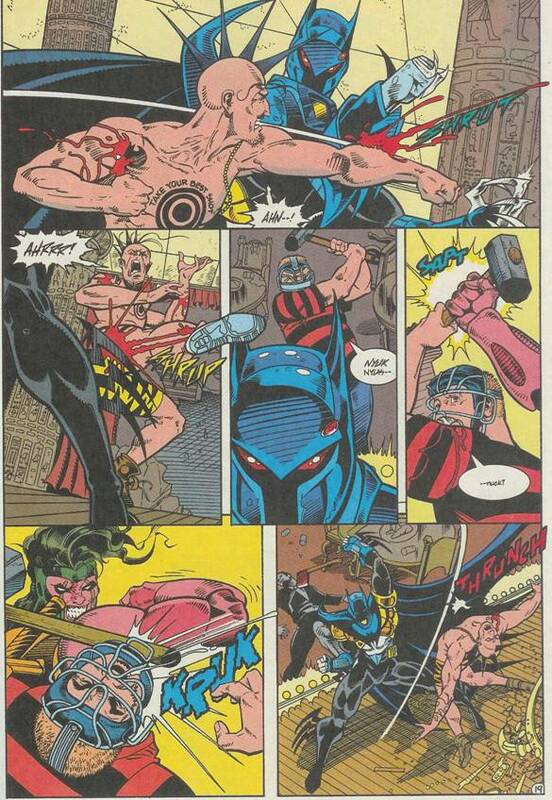 Anyway, our boys are decidedly up to date, with spandex, axes, a smiley-faced cup and pointy Mohawk, all just screaming comedy. Still, the banter is there, as well as the eye-poke. Although Mojo’s aim could use some improvement, as shown below he nails Surly in the eyebrows! I do like that chopped Sue line though. Anyway, our boys decide they’re tired of just breaking legs and go after the $100,000 reward for the capture of Abattoir, not knowing Batman is also after the slaughterhouse boy. 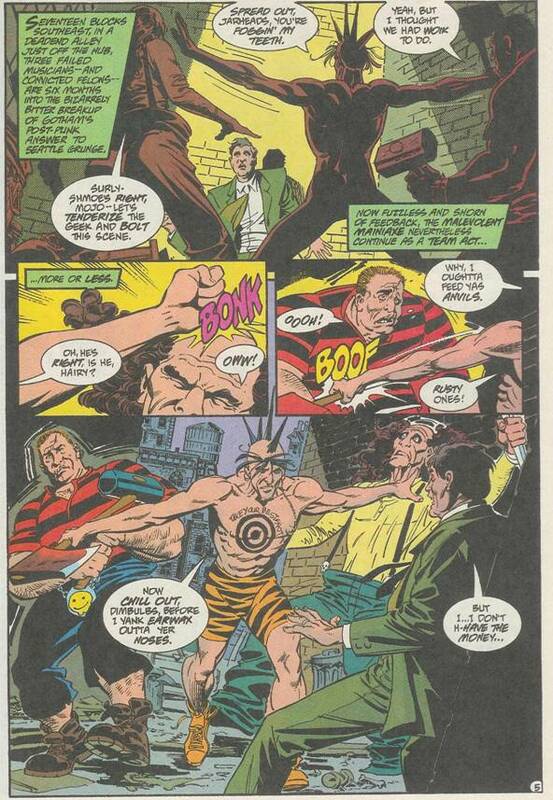 And what happens when comedy meets psychotic vigilantism? Strangely enough, the finger knives don’t cut Mojo. Go figure. The other fellow KOing Surly is Ballistic, basically a bounty hunter “superhero”. Whatever. You know, it wasn’t the greatest crossover, but I welcomed the slight humor injection in an otherwise way too heavy title. It’s nice to see comics not take themselves too seriously, after all, it’s just entertainment.